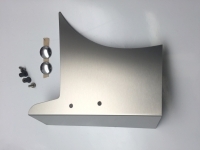 2014-2017 C7 Corvette Fan Shroud Cover. Select finish below - polished or brushed stainless steel. Get the complete show car look with our brushed stainless steel Fan Shroud Cover. Precision laser cut and designed to fit over every C7 stock fan shroud, this piece will enhance the look of your engine bay and add that extra touch. Choose finish, brushed or polished. Kit includes everything you need for easy installations!